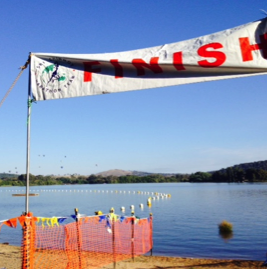 Six Viking club members ventured to Lake Burley Griffin on a beautiful autumn morning for the annual Sri Chinmoy Lake Swims event. 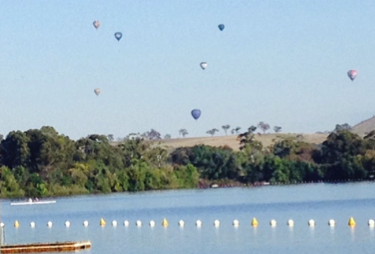 The balloons were out as well as a good number of swimmers of all ages on Sunday, 8 March 2015. The 5km event was started first, which was two laps of a 2.5km course. Greg Gourley entered this event and was the winner of his age group. The 2.5km swim was next, one lap of the same course. 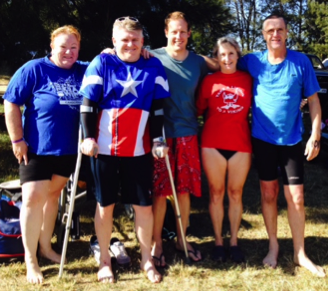 Four club members swam in this – Lisa Moore, Deborah Johns, David Bale and Nick Dando. The final event was 500m, out to a central buoy then back to the finish line with Maria Castles swimming in this event. Conditions were good and the lake temperature was pleasant. All enjoyed their swims and the novices among the group (Deborah and Maria) were pleased to have one completed lake race ‘under their belt’. 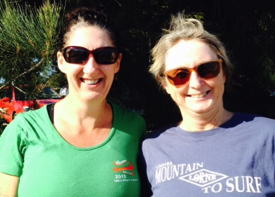 The Wednesday evening practices paid off, thanks Petrina – and a bonus 3rd place in her age group for Deborah. Afterwards, pancakes were enjoyed and swims reviewed. Whilst some of our swimmers were doing laps in the lake, some were taking on an ocean swim at Broulee on the NSW coast and some were racing up and down a 50m pool in Blacktown in Sydney – yet again the mighty Vikings are seen around the ACT and NSW showing their strength and versatility in the water!